The green area shows the predicted habitats for breeding only. 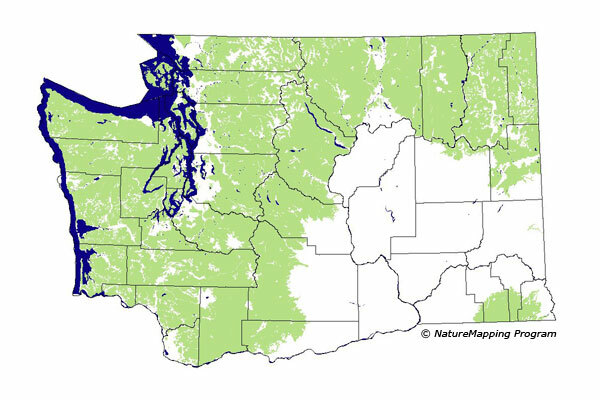 The habitats were identified using 1991 satellite imagery, Breeding Bird Atlas (BBA), other datasets and experts throughout the state, as part of the Washington Gap Analysis Project. Habitats used during non-breeding months and migratory rest-stops were not mapped. This species is fairly common in mixed and coniferous forests throughout the state, at low and moderate elevations, occurring less commonly in sub-alpine forests. All forested zones, Alpine/Parkland, and steppe zones at the edges of the Columbia Basin were core areas of use. Good habitats were wooded parks, conifer-lined rivers or shorelines, tree savanna (except in the Oak zone), and all mixed and conifer forests. They were not modeled in developed areas (other than wooded parks), though they occasionally occur in neighborhoods where conifer stand are present. Three subspecies breed in Washington: P. v. monticola in far eastern Washington, P. v. orius of the Cascades, and P. v. harrisi of western Washington. The Hairy Woodpecker and Downy Woodpecker have neatly divided the state based on their individual tree preferences: Downy Woodpeckers prefer hardwood trees while Hairy Woodpeckers prefer coniferous trees. Thus the Hairy Woodpeckers is found in virtually every zone where coniferous trees are the dominate taxa. At higher elevations, forest communities become almost entirely coniferous (even riparian corridors), so Downy Woodpeckers are usually absent, except occasionally at burns. The Hairy Woodpecker may be found even in high boreal forests, often alongside its boreal counterpart, the Three-toed Woodpecker. In the Puget Trough, where conifer trees have largely been replaced by hardwoods, Hairy Woodpeckers are uncommon and mostly replaced by Downy Woodpeckers.